Irish soda bread is traditionally a big round. I took a shrink ray to it. Here’s the problem: standard recipes make way too much bread for the two of us to eat. I halved the recipe a few years ago, and that worked out better but it was still a lot. I got to thinking, what if I made it in a form that was a lot easier for my husband to take to work? 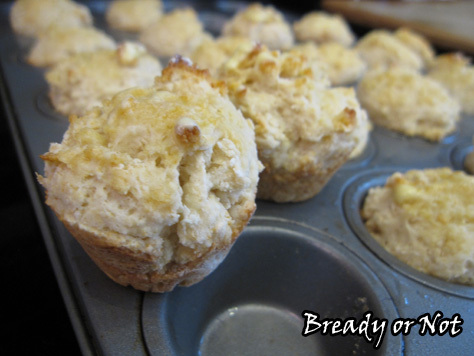 I searched online, and to my surprise, no one else had made Irish soda bread like that. Huh. So I resolved to try it, using a halved version of the same Irish soda bread recipe I posted back in 2012. It turned out FANTASTIC. The bread cooked up in only ten minutes. It was already portioned out so I didn’t go bread crazy. My husband happily took the leftovers in his work lunches–plus, the mini bread froze and thawed and tasted just as good weeks later. This recipe produces very soft, tender soda bread–not dense like some recipes I’ve tried. 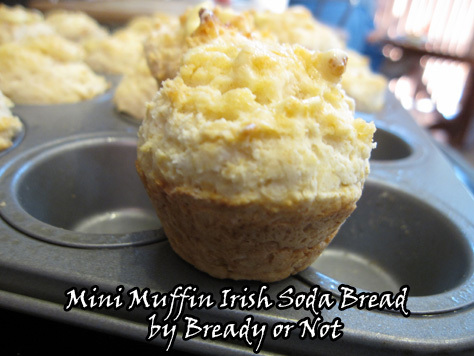 This is the only way I’ll make Irish soda bread from here on. If I need to feed more people, I’ll just use the old, full version of the recipe and pull out another mini muffin pan. Be sure to come back next week when I feature my favorite corned beef recipe–cooked in the crock pot! Bite-size Irish soda bread that bakes up in ten minutes and is perfectly portioned for kids and for lunches-on-the-go! Perfect to freeze and thaw for later meals, too. Preheat oven to 385-degrees. 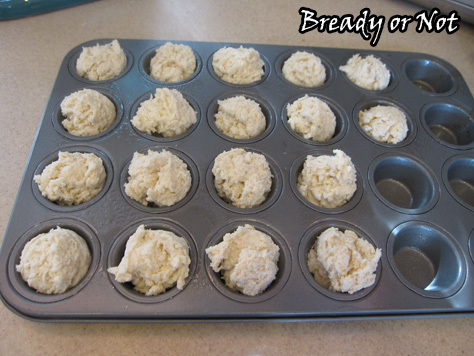 Prepare mini muffin pan by applying nonstick spray in each well, though not all will be filled. Whisk together all of the dry ingredients. Work the butter into mixture with a pastry blender or your fingertips until it resembles coarse crumbs; just as with making pie crust, you want those bits of butter in there. Add the buttermilk and stir until just combined. Knead in the bowl until the dough just starts to come together and is still craggy and bumpy, adding more buttermilk if necessary. Don't over-knead or the bread will be tough and dense. Use a tablespoon scoop or spoon to evenly dole out dough into the pan. Expect about eighteen mini muffins. Bake for ten minutes. Use the toothpick test to check middle ones for doneness. 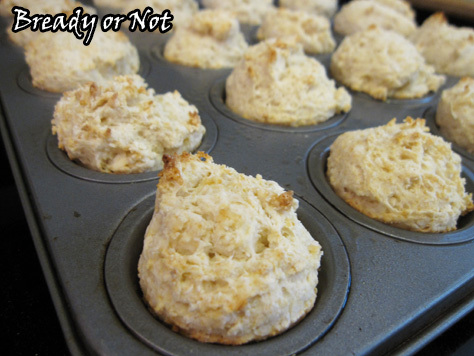 Melt the remaining tablespoon of butter and brush it on the tops of the little rounds. Leftovers freeze well, and are the perfect size to fit in lunches. lost on everything. Would you recommend starting with a free platform like WordPress or go for a paid option? There are so many options out there that I’m completely confused .. I suggest using a free platform when you’re first starting out. I used LiveJournal for a lot of years. WordPress is nice and can do a lot, but there’s also a huge learning curve. Best of luck!